Yeah, Skacel has called and the Addi Turbo Lace Needles are on the way... we should have them in by Thursday or Friday of this week! Very cool! Lace knitters, get your patterns ready! Also on the note of lace, we have received our Possum Lace from Cherry Tree Hill. These yarns are on the website and gorgeously dyed. Each hank is 440 yards in length and we have around 8 of each hank in case you need several for your project. Get some of this exotic fiber soon as once it is gone, it is gone for the year. Other exciting news is we met with a couple of reps in the past week (Euro Yarns and Westminster Fibers) and the fall line up is fantastic. We are excited about the new Mirasol line which is being distributed by Euro Yarns. 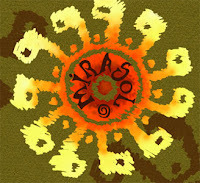 This line is a "Fair Trade" line which sets aside a certain percentage of sales revenue directly to Project Mirasol which finances a social project in a certain area of Peru. In particular, they are working on building a new school and financing the education of the children of the Alpaka and goat farmers that reside in that area. This line consists of four different weights of yarns that include blends of cotton/wools, merino wools and one that is 100% baby llama (supersoft) and a collection of patterns that are wonderful. We expect to see this yarn in early September but we will be listing it on our website for early preorder. We will have all of the colors available. Our Westminster Fiber brought us exciting news about a new book being published by Kristin Nicholas (www.kristinknits.com) and we are trying to secure a date with her to do an all day workshop on color use! This is not to be missed; watch our blog for an upcoming date for this! Also, Regia has teamed up with Kaffe Fasset to bring us a new sock yarn that is a combo of Regias wonderful sock yarn and Kaffe's amazing color use! Some of the colors will stripe and other will pattern, but all of the colorways are fantastic. This yarn will be on the website for preorder in July and available for shipment upon arrival (probably September!). We are also expecting our copies of Charmed Knits (The Harry Potter Knitted Items book) to arrive any day now. The very cool sweater with the big H on the cover is knit using Rowans Felted Tweed which we have in stock. Oh, and then there is the update on our ribbon shawls... We decided to use the Interweave Knits Diva Shawl pattern (that is actually done using Muench Diva ribbon yarn in the pattern - which is also gorgeous if one wants a shawl done in a single colorway rather than variegated we are getting from the Cherry Tree Hill Ribbon yarn)....This is a picture of the original shawl done in colorway Navy in the Muench Diva Ribbon. Carin has gotten the most done on hers (of course!) Carin is working on Silver Streak for a colorway, Nancy is working on Serengeti and I am working on Northern Lights - Paola came by yesterday for the first time this week (school vacation and her cherubs kept her at home) and chose Tropical Storm for her colorway and Hannah is out today participating in the MS walk - Go Hannah Go - she is working on Foxy Lady but we haven't a picture yet. I must say, the entire staff here is a shop owners dream... they are fun, sweet, helpful, beautiful, talented, and wonderful... did I mention everyone who meets them loves them? Well they do! Thanks Ladies! You're the BEST!